The Southern United States is well-known for its food, and if you're living there or just passing through, the food is likely to be one of the most memorable aspects of your experience in the region. The most notable influences come from English, Scottish, Irish, German, French, Native American and African American cuisines. Below are our top 10 picks for the best traditional Southern dishes! 1. Cornbread – Cornbread is considered a "cornerstone" of Southern U.S. cuisine. It is any type of quick bread made with cornmeal. Cornbreads in the North and Southern United States differ based on varying ratios of sugar and eggs. It is sometimes eaten as cereal, in which cornbread is crumbled up and served with cold milk or buttermilk. It is also more commonly baked with jalapeno peppers and corn kernels, then topped with shredded cheese. Skillet bread, another common Southern dish, consists of heating bacon drippings in a skillet and pouring cornmeal, milk, and egg into the oil. 2. Pulled pork – Pulled pork is a prevalent meat dish in the south, in which pork is cooked slowly at low temperatures to the point where meat becomes tender enough to be "pulled" or separated into individual pieces. It is usually a shoulder cut or mixed cut served in a tomato-based barbecue sauce. In North Carolina, it is oftentimes served with a vinegar-based sauce and in South Carolina, it is accompanied with a mustard sauce. 3. Grits – Grits are a ground-corn food most commonly eaten at breakfast. They are made of an alkali-treated corn known as hominy, and are similar to polenta, which is a maize-based porridge. Grits are usually served with grated cheese, sausage, bacon, gravy or butter. Shrimp and grits are served in Alabama, Mississippi, Louisiana, South Carolina, North Carolina, Georgia and Virginia. 4. 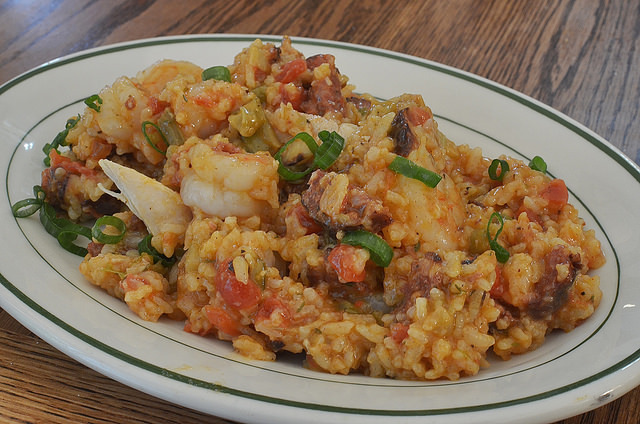 Jambalaya – Jambalaya is inspired by Spanish and French cuisines, most similar to Spanish paella. Concocted in Louisiana, jambalaya is made up of meat, vegetables, stock and rice. Popular ingredients you would taste in jambalaya include shrimp, Andouille sausage, chicken, ham, onion, green/red bell pepper, tomato and celery. 5. Deviled eggs – Deviled eggs are a popular party/holiday dish, usually served as a side or appetizer. They are hard-boiled eggs that are shelled, cut in half, and fill with a mixture of the hard-boiled egg yolk and other ingredients such as mayonnaise and mustard. Sometimes they are mixed with pickle relish, ground black pepper, cilantro, minced onions, bacon, or shrimp. 6. Fried Chicken – Fried chicken is a common cuisine in the Southern United States. Chicken pieces are usually floured or battered (often mixed with seasonings such as salt, pepper, paprika, garlic powder, onion powder or ranch dressing mix) and then pan-fried, pressure-fried, or deep-fried. A good marker of well-made fried chicken is crispy, well-seasoned skin and tender, juicy chicken inside. 7. Pecan Pie – Pecan pie is a delectable favorite in the South. The main ingredients are corn syrup and pecans. Variations of corn syrup include using white or brown sugar, sugar syrup, honey, maple syrup or molasses. Some even like to include chocolate and bourbon whiskey. Like most southern desserts, pecan pie is served with vanilla ice cream or whipped cream. 8. Moon pie – This decadent snack consists of a marshmallow filling squeezed in between two round graham cracker cookies that is then dipped in a flavored coating, usually chocolate, vanilla, strawberry or banana. Double Decker Moon Pies also offer lemon and orange flavors. They are eaten with an RC Cola in the American South. Moon pies are made at the Chattanooga Bakery in Chattanooga, Tennessee. 9. Peach cobbler – Cobblers are dessert dishes that consist of a fruit or savory filling spread into a large baking dish and then covered with a batter, biscuit or piecrust before baked. In the Southern United States, cobblers often consist of both a top and bottom crust. Peaches are cultivated in South Carolina and Georgia, so peach cobbler is a fan favorite in the South, usually eaten with a scoop of vanilla ice cream. 10. Mississippi mud pie – The Mississippi mud pie was likely created in Mississippi in the 1970s. It is a chocolate-based dessert with a crumbly chocolate crust and gooey chocolate sauce poured on top, with a scoop of ice cream. The dish resembles the mud of the Mississippi riverbanks, but tastes delicious! Read more about the South, including cheap things to do, here.